As Muslims in Guyana, Suriname, Trinidad and Tobago and other parts of the Caribbean observe the celebrations of Eid Ul Azha (this week), better known as “Bacra” Eid or Qurbani; we take you back to the year 1896, a historical chapter in the history of Islam in Guyana. It is an opportune time for us to reflect on the many sacrifices (Qurbani) that our ancestors made in their adopted homeland while instilling their religious practices on future generations, and which today has survived vibrantly in Guyana and the Caribbean. In 1896 a group of “Mahomedans” merchants from Georgetown led by Gool Mohumad Khan, Goolam Ally, Goolam Aidin, K. H. Dharsee, Kareem Baccus, and a few others of the Mussulman faith sent a petition to the Combined Court of British Government in which they requested a grant of money for the purpose of constructing a mosque and a school in Queenstown Ward (where today sits the Queenstown Jamma Masjid) and where the children of the “immigrants” would attend the school attached to the mosque. The petition was signed by Muslims from across Guyana led by Gool Mohumad Khan, who was born in 1853 and was a Yusufzai Pathan from Swat, Afghanistan. Khan arrived in British Guiana on 11th May, 1877 on board the ship King Arthur. In 1906 he returned to India with his family, leaving two of his 11 children (which can be considered a sacrifice) with his sister-in-law (who were childless) in British Guiana as well as a rich legacy of his contributions to the Muslims of Guyana. The petitioners drew attention to the fact that there was no proper place of worship or schools where they can congregate especially for Fridays’ prayers or where their children may be educated without losing their religious background. The petitioners felt that the benefits to the colony “must be apparent to the British government to have the East Indian immigrants and their children educated in a proper manner and in their mother tongue (Urdu), as well as in the English language, by teachers from one of the colleges of India.” The petitioners argued that since a great portion of the immigrants leave the Colony for India, the building of a school and mosque would serve as an incentive for many to remain in British Guiana. The petitioners further urged the Court to take into consideration that “the growing number of East Indian Immigrants in the colony, the sad want of education in the faith of their forebears and their want of an education in their mother tongue.” They also brought attention to the religious discrimination against non-Christians, and urge the government to grant the Muslim financial help, which would benefit the colony as much as the parents and children whereby the East Indian children would be better educated. This sort of pleading with the British governor general continued up until the 1950s by other subsequent Muslim organizations, but the British denied the Muslims any help. While, the Christian schools continued to receive funding from the British government but not the Muslims nor the Hindus which the petitioners raised back in 1896. At the time (1896) of signing the petition, according to the petitioners, there were about 105,463 Hindustanis in British Guiana and among those 32,432 were born in the colony and about 20,000 were Muslims. To our Muslim brothers and sisters in Islam we wish you a happy Eid-ul-Adha. A special thanks to Professor Dr. Wazir Mohamed, of the University of Indiana and the Anna Catherina Sunnatal Jamaat who shared this historical document with us. Georgetown, Demerara, 24th September 1896: One hundred and twenty-two souls living in 1896 petitioned the “Honourable The Combined Court of British Guiana” for a grant of monet for carrying out their religion. Wazir Mohammed, a Guyanese, found a copy of said petition in the British Museum bringing to light these foundational efforts by the earliest generations to institutionalize the practice of their faith and to build a community in these parts. It is the practice of many today to discount the praxis and knowledge of these earlier generations. Alleging that they were ignorant of the tenets of the faith, being overly ritualistic and devotional. This petition silences these voices as it demonstrates a clear vision for meeting the social, educational, religious, community and societal needs and responsibilities. It is not known if the petition for a grant was successful. 1. That Your Petitioners are natives of India and of this Colony. 2. That there is at present no place of worship or of education where they can attend or where their children may be educated without losing caste or their religious status. 3. That Your Petitioners have purchased property in Queenstwon Ward for the purpose of building a Mosque and a school, but they find that the means to complete the same are beyond their resources. 4. That the land purchased by them has been railed off and the foundation laid for the proposed buildings. 5. That there are at present in the Colony over 105,463 East Indians, and of these over 32,432 were born in the Colony. 6. That it is computed that there are over 20,000 of the number given as East Indians who are of the faith of Mahommed. 7. That it is proposed that the children of all East Indian Immigrants in the Colony should be educated in the said Colony in the school attached to the Mosque. 8. 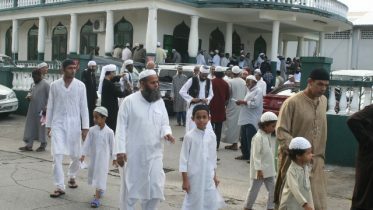 That Your Petitioners are of opinion that if such a school and Mosque were established in the Colony that the Immigrants or at least a great portion of them who annually leave the Colony for India would be induced to remain in the Colony and make the same the land of their adoption and thus the Colony would be materially benefitted. 9. That Your Petitioners are of opinion that the Immigrants from India at present resident in the Colony would purchase lands in the Colony and cultivate the same to the benefit of the Colony and on this head Your Petitioners have the assurance of a great number of the East Indian Immigrants. 10. That the benefit of the Colony to have East Indian Immigrants and their children educated in a proper manner by teachers from one of the Colleges of India must be apparent to Your Honourable Court. 11. That Your Petitioners will be able to get an exponent of their faith from India and also teachers but the means at their disposal prevent the carrying out of this plan at present except with the aid of Your Honourable Court. That Your Petitioners humbly pray that Your Honourable Court will take into consideration the number of East Indian Immigrants in the Colony,the sad want of education in the faith of their forbears and the want of an education in their mother tongue along with the education in the English Language, the want of religious service of their own, the fact that the East Indian children would be better educated, that their parents and themselves would be a resident population of the Colony and grant to them such sum of money as would be deemed meet, to enable them to carry out their religion in the same manner as a grant is made to enable other denominations in the Colony to carry out their religion. The Petition with names is attached. 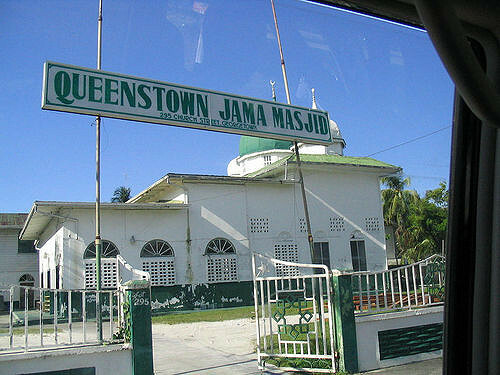 Be the first to comment on "1896: GUYANESE MUSLIMS PETITION GOVERNOR FOR ASSISTANCE TO BUILD SCHOOL AND MASJID"